Tigers are endangered in India, and after seeing this car it's no wonder. Auction house Bonhams will be auctioning this Rolls-Royce "Tiger Car" at Quail Lodge in Carmel, Calif. Aug. 18-19. Here's the story behind it. The car, a 1925 Rolls-Royce New Phantom Torpedo Sports Tourer, was originally commissioned by India's Umed Singh II, who was the Maharaja of Kotah from 1889 until his death in 1940. The Maharaja was a big-time hunter, and often hunted with international friends and visitors on the grounds of his huge private estate. In early 1925, the Maharaja found some extra cash in his pocket and contacted Barker and Co., Ltd. of London ‚Äì a coach-builder for Rolls Royce chassis ‚Äì to outfit a Rolls Royce New Phantom (aka Phantom I) for service as his estate's main hunting car. Two large Stephen Grebel searchlights, one in the front, and one in the back. The lights swiveled left to right, and were used -- in true sporting fashion -- to find and startle big game. A low gear ratio for helping the car through mud and brush, and extra-tall tires for rough terrain. (For the gearheads out there, the car had and still has the standard New Phantom OHV straight 6cyl engine displacing 7668cc (467 cubic inches), with a manual four-speed transmission. Onboard firearms include a 'Howdah' gun, which is "a large-caliber, short-range firearm useful for repelling beasts bent on attacking the car's occupants." Two lockable vertical racks in the interior have an assortment of vintage rifles and shotguns. Going bigger, a Lantaka cannon is mounted to the rear bumper ‚Äì for killing elephants. And for tigers, a "rare" carriage-mounted Bira .450 caliber hand-cranked machine gun, "once considered suitable for hunting Bengal tigers" is towed behind the vehicle. If that's not enough, the car also has a small Chubb safe which contained "contingency money set aside to compensate families of hunting assistants killed while stalking big game." Bonhams added, "In addition to the firearms currently shown with the vehicle, the Tiger Car is accompanied by an ammo box, the original copper mesh side curtains, two wide-mouth Thermos bottles as specified on the build sheets, as well as a complete tool kit." The Tiger Car stayed in India until 1968, when an Englishman discovered it and shipped it back to England. A subsequent buyer restored it, and by 1975 it was in the U.S.
U.S. Open golf champion Gene "The Machine" Littler bought the car in 1984, and three years later it was purchased by northern California car collector Rubin Jurman. 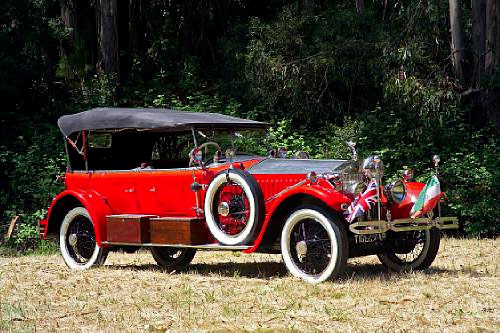 Bonhams says this "historic and exotic 1925 Rolls Royce is a truly extraordinary relic of a splendorous and lost age, and is sure to delight its next owner." That can be you, if you have the estimated sale price of $750,000 to $1 million.